Without Sam, this story would be much shorter and with a darker end for our friends. Starting in The Fellowship of the Ring, I commented that Sam was the true heir of Bilbo... and I think this chapter really encapsulates that. Among other things, we have parallels between Bilbo vs Smaug and Sam vs Shelob with actual references to the difference between her and a dragon. Sam, not Frodo with his noble and elvish air, is the hobbit to surprise others with his courage, dedication, and even wits. Of course, Sam, like Bilbo, is also the one to wish he was at home by the fire with a good meal. When Sam wears the Ring we get descriptions of how his perception and perhaps even place in the world changes, and I think this might be what inspired how they portrayed the experience of wearing the Ring in the movies. "The world changed, and a single moment of time was filled with an hour of thought. At once he was aware that hearing was sharpened while sight dimmed, but otherwise than in Shelob's lair. All things about him now were not dark but vague; while he himself was there in a grey hazy world, alone, like a small black solid rock, and the Ring, weighing down his lieft hand, was like an orb of hot gold. He did not feel invisible at all, but horribly and uniquely visible; and he know that somewhere an Eye was searching for him." Then think about how the world shifts when anyone dons the Ring in the films. The color drains away, voices sound both distant and threatening, and the searching Eye. Of course, we have one full book left so things will not end here, with orcs finding and taking Frodo into custody, and the revelation that he's merely poisoned. Whoops. Before wrapping this up, I also want to take a moment to talk about the orcs. We generally think of the orcs as not much more than violent, blood-lusting, barely intelligent or verbal thugs. But, they really aren't. Well, they are a bit violent and prone to what we might consider less civilized behavior (though the Klingons would disagree on that point), but we do need to remember that they are a mirror of elves. What Sam overhears could be the words from any fantasy setting soldiers. There's nothing particularly nasty about their words, nor anything particularly inhuman either considering their discomfort with Shelob, the Nazgul, and others under Sauron's banner. Even their fears about a great warrior loose behind their lines speak of a humanity of sorts that we often forget the orcs are capable of, instead generally seeing them as a nearly unstoppable and faceless enemy. Not that this is completely uncalled for - they are fearsome and ruthless, prone to cruel humor, and not above eating the flesh of other humanoids. But they are also aware that very little in the world looks upon them with favor and are afraid of things that go bump in the night. When looking at how this scene is mixed into the film I feel I need to start with the fact that "The Choices of Master Samwise" is scene 33 out of 60 in The Return on the King. There is some logic from a chronological stand point and from the intent to build to suspense, but it's also a bit disorienting for this sort of comparison. Sam's heroism here loses the internal motivation and reactions, and parts of it are more matter of fact and less desperate. His grief comes across well but I feel like the scene could have benefited from expressions of Sam's fear mixed with his bravery. 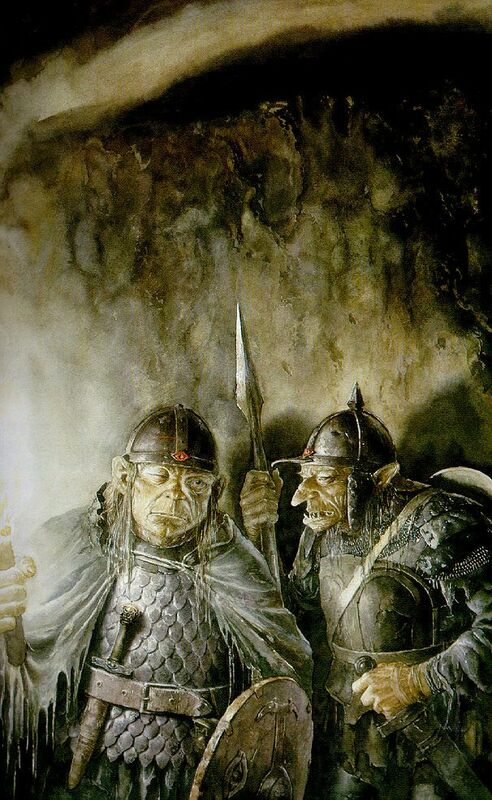 We don't get much insight into the orcs, Jackson doesn't spend much time showing them as more than warrish brutes, just giving us enough conversation to clue us in that Frodo still lives. I like the complexity Tolkien gave, but in cinema it is easier to keep the enemy as just the enemy, especially when the film already sprawls.